Chaz Robinson, knows his pickles. And loves the people that love their pickles. He’s the owner of local pickling company Sweet Sour Salty and Co. and when we visited him on a Sunday morning at the Carytown Farmers’ Market, he chatted with his customers about their families and lives, not just about the pickles. But he had plenty to say about those, too. Sweet. Sour. Salty & Co. started out with their bread and butter pickles, called “Moneymakers,” and their dill spear, but has since expanded. He started buying his cucumbers from a wholesaler, but in his second year of operation, farmers started approaching him with their extra produce including onions, radishes, apples and beets. He sells his pickles at a variety of farmers markets, stores and local restaurants like Southern Season and Alamo BBQ. As if we needed another reason to head over to Lunch and Supper, you can find his pickles there as well. He said his best seller is his pickled garlic, dubbed Dracula’s Dilemma. “We feel like if you’re in the pickle business, you’ve got to have a sense of humor so therefore all our names are kind of witty,” he said. The garlic sells three to one over everything else. Robinson said he prepares the garlic using an old French technique, cooking the garlic three times in champagne and white wine vinegar with fresh herbs. He’s not kidding. My brain almost couldn’t process how smooth the garlic was. I wasn’t initially thrilled about eating a whole garlic clove, but his description was spot on. He said it is always difficult convincing someone to try the pickled products in the first place. Once they do, people are always thrilled. 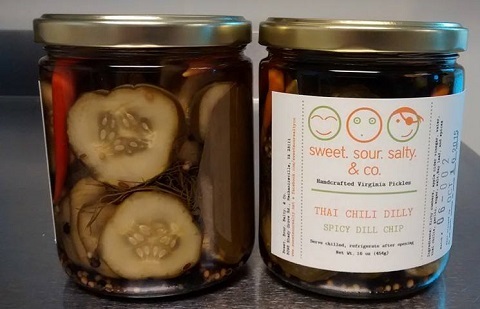 Sweet Sour Salty and Co. is one of Richmond’s many businesses committed to sourcing locally and supporting regional economy. “We are responsibly sourced, dealing with a lot of local farms and therefore our 16 different products are very seasonal,” Robinson said. Robinson said coming up with a list of products often has to do with what farmers already have. “It’s more of what the farmers have to offer me and from there I will come up with the pickle,” he said. 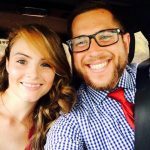 Robinson was a chef at a restaurant before he started Sweet Sour Salty and Co. almost four years ago. He started selling his wildly popular pickles for the restaurant, but eventually decided to venture out on his own off on his own. The process for the cucumbers involves a 24-hour fermentation on a controlled salinity and controlled temperature. The cucumbers are then washed, put in a jar with seasonings and the vinegar brine at which point they are vacuum-sealed. Robinson said he loves being out at farmers’ markets selling pickles and interacting with customers. Check him out on Facebook, or find him at a local farmer’s mrket. Trust us, these pickles are good. Especially with whiskey.